Much of our time as GPs is spent advising patients to lose weight and exercise more. This is largely to prevent the increased obesity-related risks of cardiovascular disease (CVD) and Type 2 diabetes (T2DM), which are well recognised. For women there are also obesityrelated risks of contraception, subfertility, pregnancy and cancers, which are less well known. Talking to our patients about these so they can enter pregnancy or post-menopausal life stages in the best possible health is a difficult area which this article seeks to discuss. Obesity is related to lifestyle changes. Supermarkets arrived in the 1950s and convenience and takeaway foods are now cultural norms. In addition, more than 77% of households in the UK have a car and the combination of lack of activity and easily obtainable high calorie foods, resulting in reduced metabolism and over consumption, is the main driver for the obesity epidemic. In Victorian England, women required 3-3.5,000 Kcal/day6 as most jobs were long hours with heavy manual labour, often as domestic servants, and their diets contained less high calorie foods. The recommended intake for women nowadays is 2,000 Kcal/day. In addition, after the menopause, calorie requirements reduce and visceral fat increases with age, although the mechanism for this is not clear.7 Social deprivation is also associated with obesity; 17% of women with a degree are obese whereas 33% of women with no qualifications are obese. There are complex interactions of calorie availability, including in alcohol, psychology and alternative lifestyles to consider in facilitating a patient’s behavioural changes. Other appetite-related peptides produced from the GIT are glucagon-like peptide (GLP-1), which reduces appetite, YY peptide, insulin and cholecystokinin. In diabetic therapy GLP-1 agonists such as exenatide (incretin drugs that are injected to prevent GIT breakdown) increase insulin secretion, reduce glucagon secretion, reduce appetite and have a tendency to weight loss. They are not at present licensed for therapy of obesity in the UK. Adipocytes are endocrine organs and secrete adiponectin, leptin and oestrogen. Adiponectin regulates fatty acid and glucose metabolism and increases insulin sensitivity. It can be thought of as an insulin enhancer.10 There are low levels of adiponectin in obesity, with associated dyslipidaemia, insulin resistance and atherosclerosis. Levels are also reduced in T2DM. Thiazolidines, also known as glitazones, of which pioglitazone is used in diabetic therapy in the UK, modulate the transcription of insulin-sensitive genes involved in the control of glucose and lipid metabolism in muscle, fat and liver. Pioglitazone increases adiponectin levels and so increases fatty acid metabolism, reduces liver glucose production and increases sensitivity to insulin. Metformin does not influence adiponectin levels. Leptin is secreted by adipocytes when lipid levels are high and regulates fat stores. Leptin acts to reduce appetite by actions at the hypothalamus. Genetic lack of leptin is very rare and causes obesity.9 Surprisingly, there are increased leptin levels in obesity and it is postulated that chronic over-eating creates receptor resistance at the hypothalamus, so obese patients are leptin resistant. Adipocytes also secrete oestrogen which becomes an important source of oestrogen in the postmenopausal woman and partly explains the increased oestrogen related cancer risks in postmenopausal obese women. The mechanisms of obesity are not yet completely understood, but 135 genes have been identified as related to obesity. FTO gene defects at chromosome 16 are most commonly recognised, as changes to this genetic site are linked with increased appetite at the brain and adult obesity, but the full mechanism of action is not yet known. In addition, epigenetics (chemical markers attached to DNA but not part of the nucleotide pairs) is thought to be a potential mechanism for foetal programming and may explain why obese mothers are more likely to have obese children; that is obese mothers may create chemical changes outside of the gene pairing to DNA which is then inherited. Patients with obesity are at risk of the metabolic syndrome. This is a condition of glucose disorder with two or more of: central obesity, hypertension, dyslipidaemia and microalbuminuria.11 Metabolic syndrome confers a three-fold increased risk of CVD or stroke and a five-fold increased risk of T2DM. Excess body fat contributes to 58% of T2DM and 21% of CHD. The South Asian population has a six-fold increased prevalence of T2DM and their rates of CHD are 50% higher,4 which is why obesity is diagnosed at a lower BMI and waist circumference. In the USA, 75% of hypertension diagnoses are estimated to be related to obesity. Blood pressure reduces by 1mmHg per 1kg weight loss with a 6mmHg reduction at 10kg weight loss.12 There are also risks of gallstones, non-alcoholic fatty liver disease (NAFLD), steatohepatitis (NASH), liver cirrhosis and heptocellular carcinoma.13 There is an increased risk of snoring/sleep apnoea and disruption of the gastro-oesophageal junction.14 Obese patients are more likely to have leg oedema, suffer a DVT and have osteoarthritis of their knees. Leg oedema in obese patients may be due to varicose veins, related to increased abdominal pressure, DVT and postthrombotic syndrome, postural pooling from inactivity in the severely obese, congestive cardiac failure, and increased risks of cellulitis and lymphoedema. Importantly, obese women are more likely to lack confidence and have depression. Although cancer can occur at any age, it is age related and is more prevalent in the older women. In 2010 there were estimated to be more than 10,000 excess deaths among women due to obesity, and these are mainly due to cancers of the oesophagus, gallbladder, pancreas, colorectal, post-menopausal breast cancer, endometrium and kidney.15 In 2015 Cancer Research UK stated that obesity causes a relative risk increase of postmenopausal breast cancer of 1.25, endometrial cancer 2.31 and adenocarcinoma of the oesophagus 2.4.16 Physical activity can reduce endometrial cancer risk by 20-30%, but 50% of obese people do not think that weight loss reduces their risk of cancer. The Faculty of Reproductive and Sexual Health Care (FRSH)17 suggest that the risks of DVT and hypertension should be considered in prescribing the combined hormonal contraceptive pill (CHC). Women with a BMI of 35 or more should not take the CHC as the risks of disease outweigh the benefits. Women with a BMI of 30-34.9 should have their risks carefully weighed, but using the CHC may be acceptable. The use of the progesterone only pill (POP) is recommended and Nexplanon, the progesterone containing subcutaneous implant, can be used in obese women without restriction or reduction in efficacy. The progesterone IM injection, Depo-provera, is also recommended but may cause an increase in weight. The progesterone containing intrauterine system (LNG-IUS) and the copper coil (IUCD) may be difficult to insert but are recommended. All forms of emergency contraception are recommended in obese women if required. 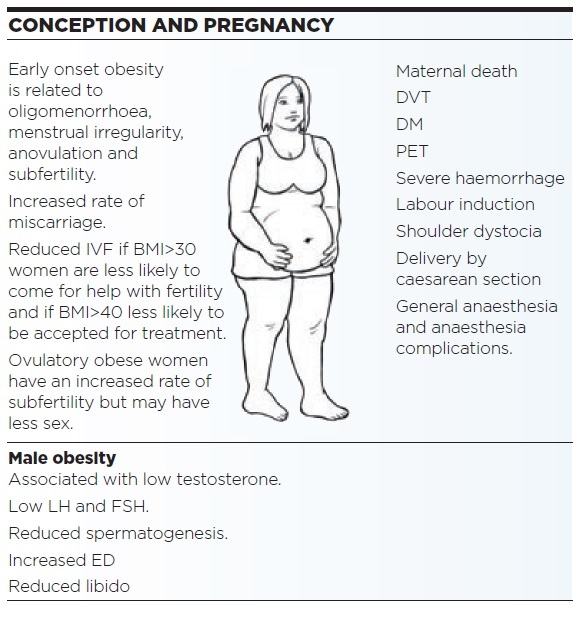 The obese woman is at increased risk of DVT, T2DM, gestational diabetes, pre-eclampsia (PET), severe haemorrhage and increased rates of maternal death.21 The obese woman is more likely to have labour induction, shoulder dystocia, delivery by caesarean section, general anaesthesia and anaesthetic complications and poor wound healing as obese tissue is relatively avascular and so hypoxic. There are also poorer perinatal outcomes of macrosomia, stillbirth and neonatal death. GPs, midwives and obstetricians should consider risks of T2DM and hypertension through the pregnancy and often patients are given heparin (DVT prophylaxis) and aspirin (if one other risk factor for pre-eclampsia and also obese). A glucose tolerance test (GTT) is arranged routinely by the obstetrician at 24-28 weeks gestation for obese pregnant women. Detecting and controlling a woman’s gestational diabetes (GDM) through dietary advice, blood glucose monitoring and therapy significantly reduces the risk of perinatal death, shoulder dystocia, bone fracture, and nerve palsy compared to routine care when GDM had not been diagnosed.21 Glycosuria at routine ante-natal testing in a well woman should prompt a GTT for GDM. The levels of glucose for diagnosis of GDM in pregnancy are not the same as those used in the normal non-pregnant population. In addition, the use of HbA1c is not reliable in pregnancy. Lastly, a number of pregnant women will be known to have diabetes and NICE has specific guidance for this group.22 In severely obese women multidisciplinary teams are required to consider equipment, handling, IV access, labour and operative risks. Bariatric surgery follow up NICE CG3 indications for considering bariatric surgery are BMI >40 or patients with a BMI of 35-40 and a significant disease aggravated by weight and failed non-surgical measures. The patient must be fit for a general anaesthetic and surgery, and agree to long-term follow up. Patients are advised to avoid conception for 12-18 months post bariatric surgery, though there is limited evidence for this recommendation at present. While trying to conceive, and in early conception, women post bariatric surgery should take folic acid 400mcg daily, but as they should already be on long-term multivitamin and mineral supplements (Forceval vitamin daily), they are already ingesting this dose of folic acid. If they have T2DM and/or obesity this dose should increase to folic acid 5mg daily to 12 weeks gestation – as in the advice above for pregnancy – related risks. There is a recommendation for blood tests for vitamin levels in every trimester of pregnancy for women after bariatric surgery; they should have bloods for ferritin, folate, vitamin B12, calcium and fat soluble vitamins (A,D, E and K).23 Pregnant women are referred to a multidisciplinary team which includes a bariatric specialist dietician. Treatment of obesity revolves around lifestyle weight management programmes, preferably in groups. Patients can self-refer or referrals can be through health and social care practitioners and care is integrated by local authorities, local providers and CCGs.24 The aims are to lose weight or to prevent further weight gain through dietary and exercise change. There is no particular diet that is superior to others. Patients should undertake moderate exercise for 30 minutes five days a week. To prevent obesity 45-60 minutes of moderate intensity exercise is recommended a day but if a patient has lost weight, having been obese, they may need 60-90 minutes of exercise to keep weight off.3 This is a big commitment. National sources to recommend to patients are available online at Change 4Life26 and NHS Choices.27 Weight management programmes benefit patients with a BMI >30, or lower if from black and ethnic minority groups, or if there are other risk factors like T2DM. If there is capacity, programmes can be accessed at BMI 25-30; long-term dietary and exercise plans are provided and encouraged. There is evidence for health benefits if patients lose 5% of their body weight for life; the average weight loss is 3% but it is variable and long-term support is important. Services have outcomes measures of percentage of patients losing 5% of body weight, percentage of patients losing 3% of initial body weight, percentage of patients adhering to the programme, and weight at 12 months after the programme finished. GPs may want to prescribe orlistat if the patent has a BMI >28 plus other risk factors, or a BMI >30 alone. If the patient does not lose 5% of their body weight at three months on orlistat they should have the medication discontinued. Orlistat interferes with fat absorption and so may affect fat soluble vitamins, A, D, E, K and use over 12 months needs discussion of benefits and harms. The obese woman attending the GP or practicenurse should be thought of holistically, not just as a hypertensive or CVD risk. Risks regarding conception, pregnancy outcomes and cancer are not widely known and discussed and there is poor written patient literature at present. Timing the advice and not upsetting the doctor-patient relationship over a deeply personal issue requires a skill set that is inherent to general practice and continuity of care. There are some concerns in the elderly overweight and obese groups that dieting can cause loss of muscle (sarcopoenia) and so weakness. There are a confusing number of stepped weight loss services and patients can self-refer to some of them. Services explore diet, cookery classes and gym membership so that exercise programmes are linked to long-term dietary plans and supportive behavioural change. Clearly it is difficult to lose weight, and maintaining weight loss requires a lot of commitment but in achieving success the burden of illness among individuals and the benefits to society and NHS costs are highly significant. Governments have belatedly started to address the issues of a car-centric, high calorie convenience food society but there is a long way to go in obesity prevention. 10 Lihn A.S., Pedersen S.B., Richelsen B. Obes Rev. Feb 2005; 6: (1): p.13-21.